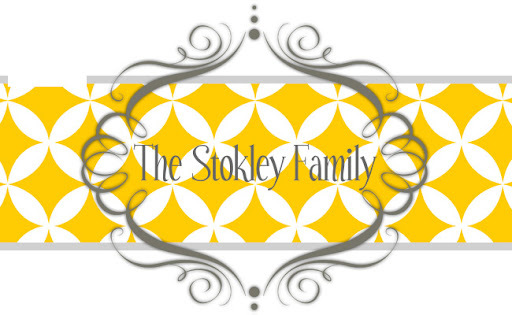 The Stokley Family: Happy Valentine's Day! Even though Ryan and I don't really buy for each other he does always get Ryleigh flowers every year. She looks forward to it every year. She kept reminding us all that Valentines was on Tuesday and I think it was really so Ryan wouldn't forget to give her flowers. Here was their little set up Tuesday morning. Ryleigh also got me a present! She wrapped it and it had been sitting in the living room since Saturday. I technically already knew what it was because I saw it when we picked her up on Saturday but I pretended I didn't know. I forgot to take a picture of it but it combines 2 of my favorite things! Cats and Stuffed Animals!! (Please tell me you knew I was being sarcastic there :) I acted like I LOVED it and it is currently sitting on my bed! It's a stuffed animal cat that has a red heart hanging out of it's mouth. She caught it a Mardi Gras parade on Saturday and was so proud of her gift to me! Although I may not be head over heels in love with the cat I am head over heels in love with her! She has such a giving heart when she wants to! I KNOW!!!!!!!!!!!!!!!!!!!!!!!! How AWESOME is she?????????? So Awesome, is the words you are looking for. She had stopped at the Dollar Store to pick up some note cards for me and I had made the comment that she should get me a Reese's for Valentines day. So when she was checking out she asked the girl if she bought all of them could she have the display as well. The girl thought she was crazy but let her have it anyway. Also, did anyone notice those are Easter Eggs not Valentine hearts? I didn't until way later. Thank you Whitney for making my Valentines wonderful while also making me gain 100 pounds. I know you technically don't have to eat them all in one night but what's the fun in not? Portion control, yes I do have issues with it! We ended the night by Whitney and Wesley lying to the kids and saying they used to work at the Lego store in Disney. The kids believed them and thought they were the coolest people ever. Tanner was still talking about how Wesley is the best lego builder in the world! We also had a nerf gun fight and I have a feeling I'll be finding nerf darts all over my house for the next 27 years.